#bassmusic #beats #dub #dubstep #footwork #trap #dnb #jungle ..
EZ Riser is the solo project of Sohail Arora pushing cutting edge electronic music with a heavy emphasis on bass. As one half of Bay Beat Collective (BBC), India’s oldest bass crew, Sohail Arora has been pushing bass music for over 8 years now. He has played a big role in building the bass music scene in India as an artist and a promoter. His solo project EZ Riser aims to showcase newer forms of electronic music with particular focus on beats, footwork, drum & bass, trap, hip hop and bass house. A self confessed music geek and influenced by artists such as DJ Rashad, Clap Clap, Zinc, Machinedrum, Addison Groove, Om Unit, Stray, Romare, Four Tet, Flako, J Dilla, Kendrick Lamar, Nicolas Jaar and many more, EZ Riser’s spectrum of music is highly versatile. As the founder of KRUNK, India's foremost alternative booking agency and events crew, Sohail has been responsible for touring acts such as Alix Perez, Dub FX, Calyx & Teebee, Concord Dawn, Klute, London Elektricity, Koan Sound and Dub Phizix across India. Over the years KRUNK has been instrumental in producing and elevating some of the biggest and most prolific talent in India. Sohail has helped artists like Dualist Inquiry, Sandunes, Nicholson and Shaai’r and Func take root in the industry that they’re now dominating, whilst representing some of the current leading Indian acts such as Su Real, Madboy / Mink, Alo Wala, B.R.E.E.D & Tarqeeb. Sohail also runs India's only dedicated bass night / festival called Bass Camp Festival. Ultimately, it's EZ Riser's fidelity to the low end that ties his sound (and most probably life) together. 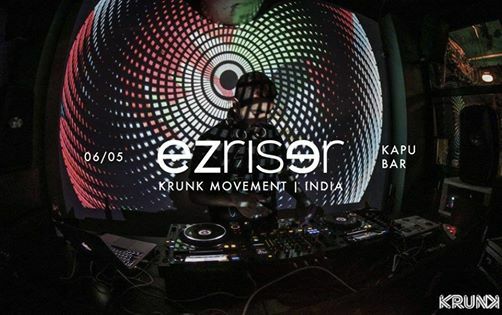 EZ Riser has toured all across the world performing in places such as UK, Germany, Croatia, Norway, Netherlands, Slovenia, Srilanka and has also played at Europe’s leading festivals like Outlook Festival & Dimensions Festival.